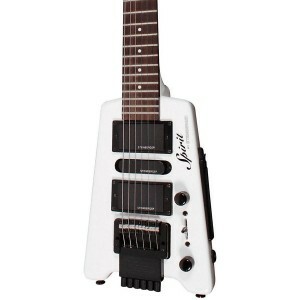 The Steinberger Spirit GT-Pro, my dream guitar? Yes I think so! If you are looking for a guitar which is a true original then there is only one instrument you should be considering the Steinberger Spirit GT-Pro. Steinberger guitars require very little introduction. From the moment they were introduced in 1979 they have remained at the cutting edge of guitar design. The original instruments were made entirely from what became known as the Steinberger blend which was a proprietary graphite and carbon fibre mix. 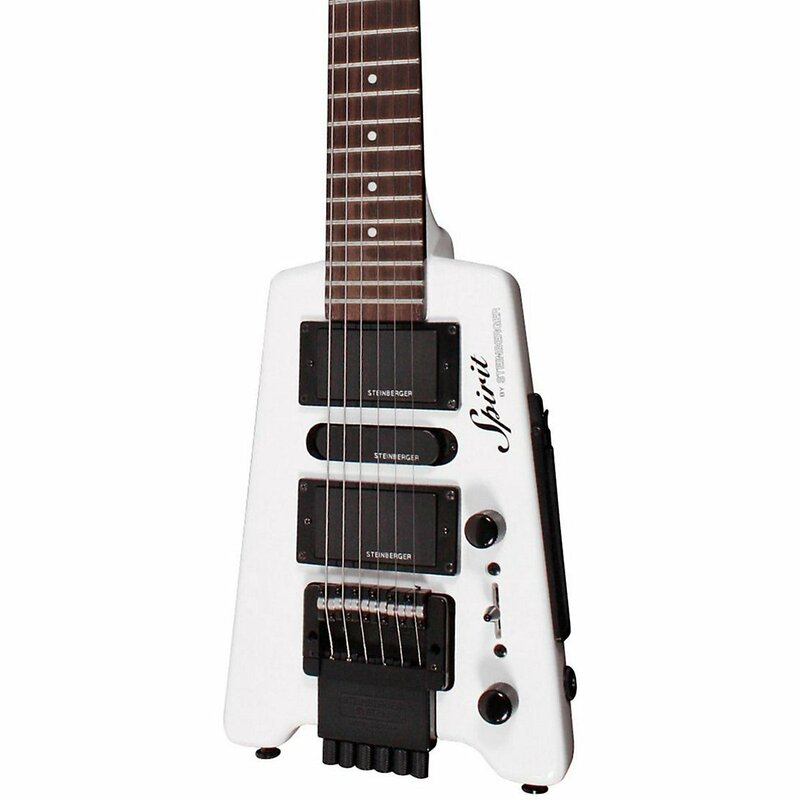 The chocolate box body design, the absence of a headstock combined with the patented Steinberger Trans Trem system meant that the guitar challenged what was possible with guitar design. From the pioneering days of the late 70s Steinberger rapidly grew but could never quite keep up with demand so was sold to Gibson in 1987. Unfortunately, with changing musical fashions, the complex manufacturing process and extremely high prices of the guitars Gibson stopped selling Steinberger guitars in the mid-1990s. Thankfully enthusiasm for the Steinberger guitar design re-ignited and Gibson re-introduced the range recently and the Spirit series is part of this upgrade of an old favourite. The complex materials used in the manufacture of the original Steinbergers have largely been dropped in favour of a wood/graphite mix. This decision by Gibson means that the guitars are easier to produce and therefore a whole lot cheaper, which in my opinion is a welcome change. So what do you get from the modern Steinberger Spirit GT-Pro? Well Gibson have certainly not chosen to re-invent the wheel with this guitar and really why would they? The Steinberger Spirit GT-Pro has the same innovative design that you would recognise from the original and classic GL Series. However, the cutting edge materials used in the manufacture of the original GL series have been lost in favour of something a little bit more traditional. The body is made from maple and the 3 piece through body neck is also made from maple and is reinforced with an adjustable truss rod. The neck is, of course, designed without a headstock and features a 24 fret rosewood fretboard. For many the neck and therefore the whole guitar appears un-natural because it does not have a headstock. But for me I like the look of it and it I also feel that it makes it easier to finger certain chords close to the nut. The Steinberger Spirit GT-Pro of course features the truly original R-Trem locking tremolo with patented double ball bridge. The beauty of the bridge is that you can hit the whammy bar and all the strings will stay in tune. So, for example, if you play a chord and depress the whammy bar the whole chord drops in pitch and stays perfectly in tune. This gives rise to the possibility of some great playing effects that cannot be replicated on any other guitar. Think “Get Up” on Van Halen’s album 5150. The Steinberger GT-Pro with two humbuckers, in the neck and bridge position, and a single coil in the middle position. Master tone and volume controls as well as a 5 way pickup selector allows full access to the tonal potential of this guitar. So is the Steinberger Spirit GT-Pro a good guitar. Well I guess that very much depends on whether or not you like the look of it. It is certainly a design that you either love or hate. For me personally I love it so I am perhaps biased. But putting the looks to one side the Steinberger Spirit GT-Pro comes armed with some serious hardware which really makes it a great guitar. So putting my money where my mouth is I will certainly be buying one!